Today's introduction hails from the beautiful Vancouver, and it's a small batch body care and candle company with some of the most amazing packaging and scents I've ever experienced. The brand is Harlow, and after trying out a few gems from the line for the past several months I am so thrilled to be able to sell it on Healuxe Beauty. The brand is full of wonderful body butters, body whips and candles that have some of the most mesmerizing and unique scents. I've been using the brand's Fog Body Whip* daily and have been thrilled with not only how hydrating it has been (all without any of that dreaded leftover greasiness) but how delightful it smells. Filled with essential oils such as Himalayan cedar wood, peppermint, vanilla and vetiver I found this scent to be a perfect neutral for me. I'm fairly sensitive to very strong scents (and my boyfriend is incredibly sensitive to them) so I always prefer a lighter fragrance, and the combination of oils in Fog are just lovely. For candles, I've been alternating between the brand's Smoke candle* as well as their Bohemian candle. Harlow's candles are all filled with eight ounces of 100% eco-soy and a wooden wick that makes each candle burn more evenly than anything I've ever used. 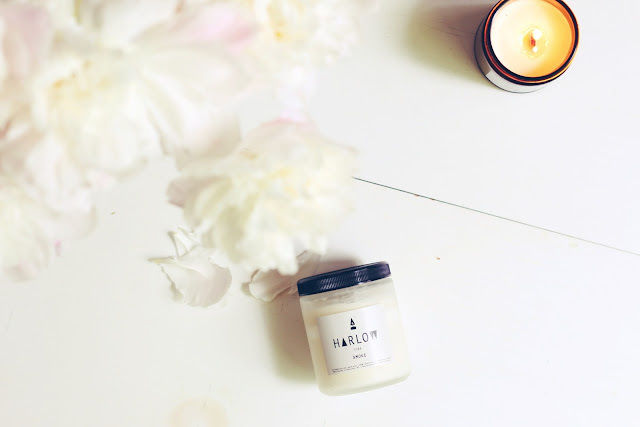 I don't know about you all, but I almost never am able to get a candle to burn evenly - with Harlow's offerings I not only find that the candle's scent throws wonderfully but the wax burns so evenly that I know I won't have any going to waste. Each candle has an approximate burn time of 50 hours, and from my experience I can definitely see that being an accurate estimate. I've been burning my Smoke candle almost daily for several weeks and still have a solid 50% of it left. The Smoke candle contains notes such as Virginian cedar wood, frankincense and cardamom, giving it a neutral light floral scent that I find to be perfect for summer without being overwhelming. I've also been using their Bohemian candle (which is a name I adore) and that one has notes of grapefruit and vanilla, making it a far more strong scent than Smoke. I find with this one that burning it for even just fifteen minutes completely envelops a room in the scent, helping it to last a whole lot longer. Harlow truly has some of the best candles I've ever tried, and I'm so excited to trial more from the line. I have many more of their candles currently on my wish list, specifically I have my eye on their Orange Flower candle which sounds like a beautiful complement to this warm weather.